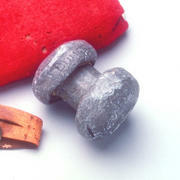 Accompanying the dumbbell is a one-inch-wide leather strap fastened with a large brass button. Its presumed purpose was to give extra support to Jefferson's wrist. The red woolen and linen cushion has three pairs of loops on the bottom by which it could be securely tied to the arm of a chair. Perhaps fastened to the writing arm the revolving Windsor Chair where he often worked, it provided a comfortable rest for his arm. Dimensions 3 1/2 x 2 5/8 in. ; Wt: 4 lb. 5 oz. Thomas Jefferson to Vine Utley, 21 March 1819, Albert Ellery Bergh, The Writings of Thomas Jefferson, 15: 187. William Howard Adams, The Eye of Thomas Jefferson, 2:73. Dumas Malone, Jefferson and His Time, 382. At different times, Jefferson refers to this injury as either a dislocation or a broken bone. Thomas Jefferson to Robert Mills, 3 March 1826, American Memory Project - The Thomas Jefferson Papers.